Canyon Rim School InformationCanyon Rim has been named because it sits on the south rim of Parleys Canyon. 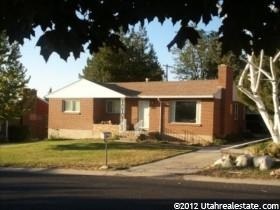 This is another popular place to live in the Salt Lake Valley because of the location on the east bench. This area has a flair of its own from the single level homes to some homes which have been torn down and rebuilt. The area can be described as quaint. Why Live in Canyon Rim? The location very centrally located in the Salt Lake Valley and you can access all the ski resorts within 25 minutes. This community has all denominations of religion and churches available throughout the area. A popular park nearby is Tanner Park which has become known one of the "Dog Parks". Here you can walk your dog through the park on leash and then go down on a dirt road into the gully where the dogs can run off-leash. The lower gully has been well maintained by all the dog owners to make sure this continues on as a dog friendly area. There is also a trailhead in Tanner Park that continues onto the Shoreline Trail of Salt Lake. This trail runs from the University of Utah to Draper. There are miles of trail and some of it has been paved. This is popular with bicycles, runners and hikers to get them away from traffic. The real estate values in the Canyon Rim area have retained their values through the real estate "slump" and have continued to rise over the past year and a half. There is plenty of shopping nearby with Smiths grocery store and the popular store REI. There are several strip mall nearby which have various shops and restaurants. Planet Fitness has come into the area as well as Momentum Climbing Center. What are the schools like? The schools are in the Granite School District and still are among the top rated schools. Eastwood Elementary and Upland Terrace are the elementary schools. Wasatch Jr. High is 7 - 9 grades. Wasatch Jr. was recently rebuilt and has the state of the art classroom and technology, this is a very desired junior high school in Salt Lake. Skyline High School is 10 - 12 grades. Skyline High has the International Baccerlerate Program which encourages learning in all areas. Should the child complete this program and test well on the AP test, there are always scholarships available for colleges throughout the United States. There is a charter school called Canyon Rim Academy which is top rated. Westminister College and the University of Utah college is within 15 minutes of this area. The Venture Out summer program will be starting in June for Friday night festivities throughout the area. These include free movies, live music, community markets, recreation activities and artisians & exhibitors -- all this is free.